2. Who eats more? Usually Matt, but it might be a toss up when I'm prego! 3. Who said "I love you" first? Matthew did, the night he rolled his ankle really bad at his brother's place. It was so bad he couldn't make it down the stairs to go to his apt, and had to sleep on their couch. I was also staying there, so I took care of him throughout the night. After I finished reading the scriptures out loud to him, and I was getting ready to fall asleep on my side of the room, he told me that he loved me. It was super sweet and don't worry we were very good kids, even though we had to sleep in the same living room! 5. Who is smarter? I think that Matt is smarter in a lot of areas, I mean he is a pilot and all! But, in other areas he would say that I am. 6. Who is more sensitive? Probably me, but Matt does have a very sensitive side. Try watching the Notebook with him! 7. Who does the laundry? I usually do the laundry, but I hate folding it, so Matt usually breaks down and folds it for us. 9. Who pays the bills? We both have bills that we are responsible for paying. 10. Who cooks more? That is definitely Matthew! He is a much, much better cook than I am, plus he enjoys cooking and I don't. 11. What meals do you cook together? It depends on what's going on. We make fajitas together and my Grandma's potato soup. 12. Who is more stubborn? Matthew. 13. Who is the first to admit they are wrong? We are first to admit that the OTHER is wrong! 14. Who has more siblings? Matt, he has 4 brothers and 1 sister. I have a brother and a sister. 15. Who wears the pants in the relationship? Neither of us! My pants are getting too tight, because I'm pregnant, and Matt's are getting tight from sympathy weight! Really I couldn't say who wears them. We try to work together on making decisions. 16. What do you like to do together? We like to pretty much do everything together. I can't think of specifics. 19. How did you meet? I went to the Singles Ward in Orlando to hear a good friend give a talk, and Matt was giving a talk too. I recognized him from the dance that I had just gone to. He was hanging out with my sister's future husband. Matt could not take his eyes off of me the whole time he was giving his talk, so of course I had to go and talk to him after sacrament meeting. I had to wait for the other girls to clear out away from him though! He followed me into Sunday School and sat with me. 20. Who asked out who first? Matt asked me out first, but after I helped him along with the process. We lived about an hour and a half away from each other, so I had to show up at the Singles Ward another time, so that he could see me again. After spending that Sunday together at a service thing at the mall (its a long story), he asked for my number and took me out that week. 22. Who proposed? 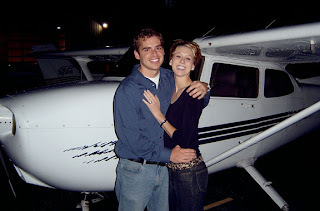 Matthew proposed in an airplane he was flying, over the Orlando Temple at night time on December 13, 2003. It was beautiful. We were married on March 20, 2004 in the Orlando Temple. 23. His best features? His height and his hair. 24. What is his greatest quality? Matt treats me like a princess. He really does so many nice things for me. And, he is a great father. He loves playing with Mattie and showering her with love. I tag... any of my sis-in-laws that feel sentimental, and Faith and Erica. Cute! I didn't know you and Matt and Steph and Greg had your first kisses on the same day. Was that service activity at the mall the one where people make crazy displays with canned food? It totally was! That's so funny that you know about the crazy canned food displays! Did he put it on auto-pilot to get on one knee? I don't think I realized you guys got engaged on Brett's birthday! Definitely a cool engagement proposal. And what's the deal with the Notebook? I've never liked chick-flicks much, Brett was totally into that movie and I was bored to tears. So fun to read! You guys are the cutest!! ..still trying to remember what The Notebook was all about. If he read the book too it must have been a smash. Matt IS kind of a pansy sometimes:)Or gentle giant...or giant fat matt. OOoohhhh...Rachel McAdams. Does he have a secret crush? She kind of resembles you, Heather. You got your pictures! yours looks great! I'll stop leaving comments on the same post--annoying, huh! I seem to remember having some dust get in my eyes during "The Notebook". However, I think I cried more in "Saving Private Ryan" though. Go figure. . .